Reminder: Don't forget your appointments! Did you ever forget the Reminder of your friend/wive/husband ? Well I did ! Therefore I wrote a program that reminds me of important events. The program starts warning an adjustable (for every event) number of days in advance so you have ample time to buy a present or send a letter. 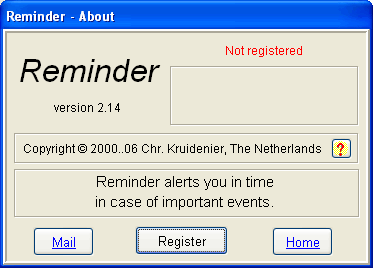 Reminder is the name of that program, it is a "reminder" for events. It runs under W95/98/00/NT/XP/Vista/7. The Demo version can be freely downloaded and is fully fuctional during 30 days. Reminder can warn you every week or every two weeks, every month, every two month, etc. 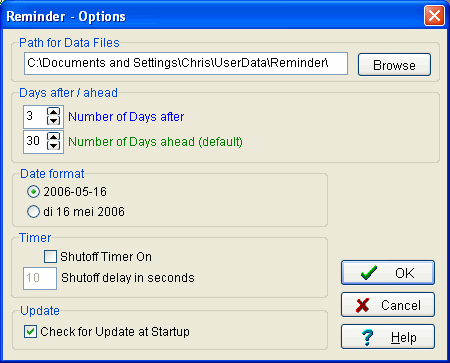 Reminder features an extensive context sensitive help function. Registration only costs US$ 10,-. You will get an unlimited fully functional program. You will be alerted of updates by e-mail. Registered users may download them freely. At startup of your computer Reminder is started. It shows events within an adjustable period before and after the event. 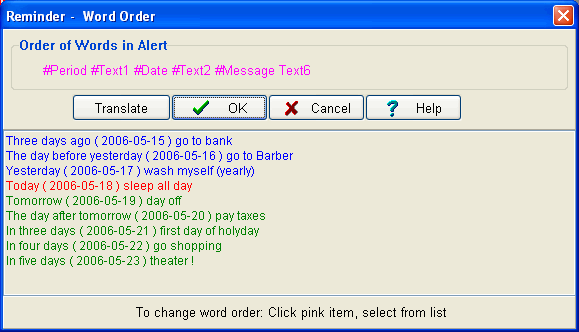 You can change the words and their order used in the alerts. Normally you don't need this button "New". You may edit the default Reminder file to accommodate all your wishes. If you want to create a new file from scratch use this button. The default filename of the reminder data file, with all reminder data is called "Reminder.dat". Reminder automatically reads this file at first startup. In order to open another file, use this "Open" button. Note that Reminder will remember the last file read. So to see "Reminder.dat" at startup again you will have to open it before closing Reminder. The Number of days ahead to be alerted (Click the "Default" button to select the default value). 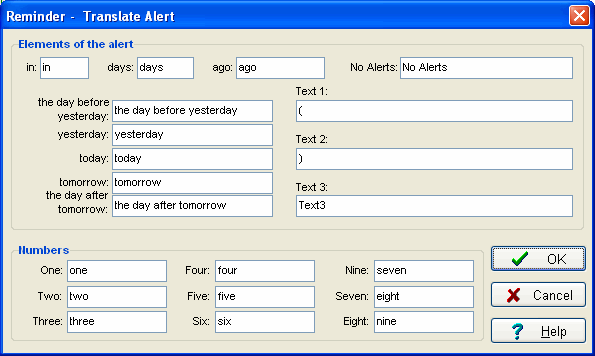 The Date of the First Alert (Click the "Now" button to select the current date). Default Colors Use this option for the Default colors; Blue for passed events, Red for current events and Green for future events. 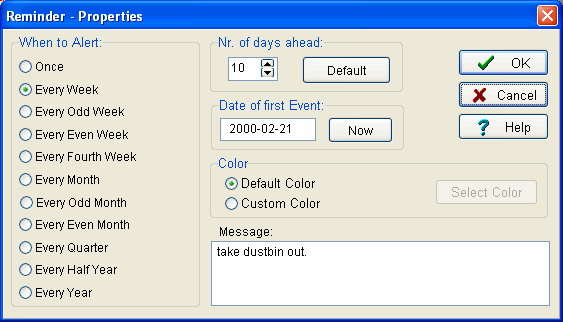 Custom Colors Use this option to give each event its own Color. For instance Green for private events and red for business events. The first window of the translate procedure is the Word Order window. Here you can change the order of the words in the messages. "-" will be invisible in the message. In the lower part of the window you can inspect the results of your changes. 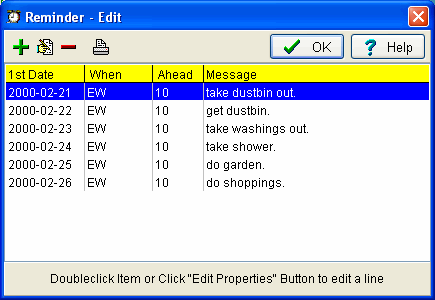 In the default word order supplied, Text1 and Text2 are filled with resp. "(" and ")" so the date is included enclosed with brackets. Click the "Translate" button to translate the messages to your favorite language, then correct the word order if needed. As shown every word can be replaced by its translation. In the default translation file (c:\windows\Reminder.ini) the translation is the same as the original word. For some languages, after translating, you will have to correct the word order. Clicking the "Save" button saves the Reminder data. This button is only enabled when the data have been changed. If needed the changed data will be automatically saved closing the program. "Path for Files". Enter the place to put your data files. "Number of days after". This is the number of days after the event the alert will be shown. "Number of days ahead". This is the default number of days you will be alerted in advance. "Date format". Here you may select the European standard format or a format with the short name of the day and the month. "Timer on" condition. If this item has been checked the program will exit after an adjustable time. "Update". If this item has been checked, then then Reminer will check - one minute after its startup - if an update is available. "Help Index" - Click this item, to get the Index of the Help pages. "About" - Click this item to get information about the program and the author. Click the "Register" Button in the About window to start the registration process. Click the "Exit" Button to end the program. If data have been changed, they will be saved automatically. 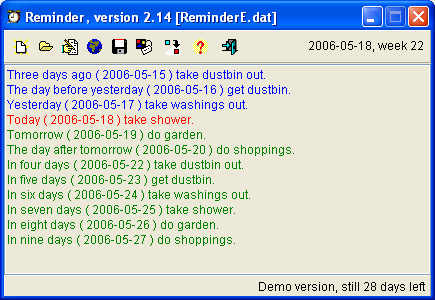 The demo of the program Reminder is freely available. If you like it please register the program. For only US$ 10,- you get a fully functional program and you will be notified of updates and bug fixes. You can always download the latest version enjoying most of your registration. The small fee for registration enables me to continue improving the program. Do you have any remarks please send them to me by e-mail. Give the demo to your friends ! The demo is free. You may try the program without any risk; it can be simply removed from your computer ("Start | Configuration | Configuration window | Reminder" => Click the Add/Remove Button). Click Download and check "Open". Click "OK" and the download starts. After downloading the program will be installed on your computer. Follow the directions in the installation program. Click Download and check "Save as...". Enter e.g. "c:\Temp" as destination. Click "OK" and downloading starts. The file "rmev221.exe" will now be saved to the directory "c:\Temp"
Now follow the directions in the setup program to install Reminder on your computer. Something to tell? Please send an e-mail.